Yay for Spring! Spring is my favorite season here in the Midwest. I so look forward to warmer weather and flowers and being outside. 1) There are a ton of flowering pear trees, I believe also called Bradford pear trees (?) in Grosse Pointe. They are really stinky – not sure what smells exactly, the blossoms? – but so pretty. They have a bad rap as being weak (we lost a huge portion of the one in front of our house in a storm right before we moved in), and possibly considered an invasive species? You’ll have to look this one up yourself. No time for research this week! 2) It’s so exciting watching plants come out of the barren ground. How they just rise from seemingly nothing and by summer are bursting with green, fluffy leaves and other colors. Amazing! And very uplifting. The photos above show the same plants three weeks apart, the earlier shots taken at the beginning of April. 3) I started tending the garden beds this month, weeding, sprinkling blood meal around the hostas (I still have to look up the spelling of this plant gah!) to deter bunnies from eating the young shoots, fertilizing (no pesticides! ), planting vegetables (kale, peas, green onions, lettuce). I thought of Shirley a lot as I was weeding around all the plants she’d gifted me and asked her what surprises she had in store for me this year. Not long afterwards, her daughter (professional gardener and horticultural writer/speaker), came over one evening during a visit to her Dad’s (she lives out of town). She gave me loads of plant suggestions and tips specific to the different areas in our yard, one of them being to stop trimming my Japanese maple, which is supposed to be a weeping tree, but it hasn’t been weeping b/c I keep cutting it (but it is weeping on the inside). Oopsie. Later that week, another of Shirley’s daughters brought over a box of hostas she’d pulled from her yard. And the following week, Shirley’s garden helper Trish (who continues to tend their garden) gave me three plants she’d divided and pulled up from Shirley’s plant beds. If I think about it too much, I can make myself so sad when I’m out tending to my garden, as I’m used to seeing Shirley in her yard doing the same. I miss her sweet demeanor and positive attitude, and I miss learning from her. But it seems she intends to stick to her promise about continuing to live on through her loved ones and through her plants. I didn’t doubt her exactly, but it’s nice to be reminded. 3) Three years ago I lamented about Detroit’s Chinatown, or lack thereof in THIS entry. 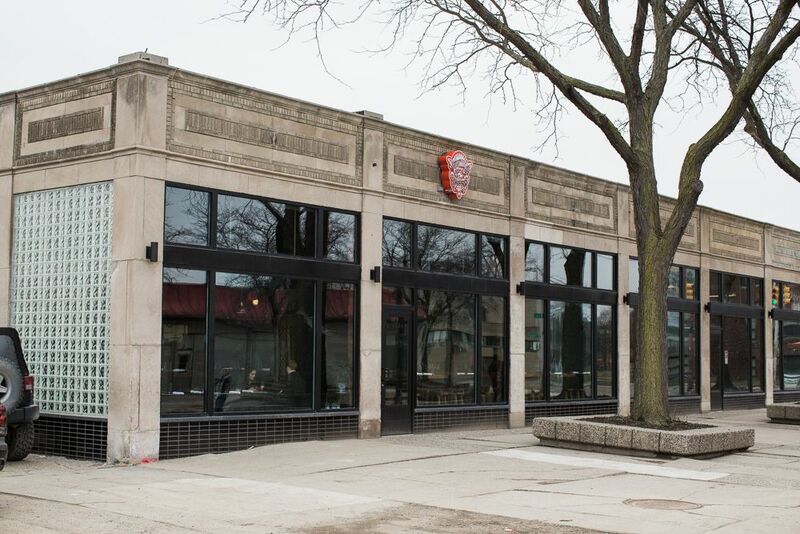 I’m happy to report that the vacant block pictured in my post (also shown above for those of you who aren’t click-through-ers) now has some new retail spaces, one of which is a Chinese restaurant called Peterboro. We went there with some friends after a workout session at Jabs Gym (more about that in a minute). It was after 10pm and there were 14 of us who walked in looking for a table and they were able to sit us at one of their high tables. The staff was friendly and patient and the food was yummy enough to satisfy my Chinese food cravings. Some dishes were really good while others were just okay. My husband and I went back for date night recently and tried a few new dishes, plus a couple of their craft cocktails. Two thumbs up! 4) Speaking of date night, the night we went back to Peterboro, I successfully put on some false eyelashes – woohoo! I’ve worn them before for the band, but they never felt right and I think it’s because I wasn’t cutting them to size or placing them about a 1/4 inch away from the inner eye. I’d been complaining about my thinning eyelashes to a friend and she gifted me with a couple different pairs and some eyelash glue to boot. Also thanks to some very glamorous gal on a YouTube tutorial, I was able to nail the technique. They felt comfortable and looked awesome. I wouldn’t go as far as to say they looked natural, but that wasn’t exactly the look I was going for anyway, so I consider it a success. Once I get the technique down (I did a good job, but it took a while), you may not see me around town without them! 5) Speaking of going out, my workplace’s auction is coming up in May and I was going to recycle my New Year’s Eve dress, but decided to shop for something new. After looking and looking, I found this fabulous number by Halston Heritage. It was sooooo awesome on but…I thought slightly inappropriate for a school function, so it got returned. Too bad, so sad. After that disappointment, I decided again on the New Years Eve dress, but decided to give it one more shot at a local boutique called Dawood. The gal there was really nice and helpful, and I tried on a bunch of cute dresses, but decided on this little black one. I don’t normally go for the bell sleeve (in fact, I hate them), but they didn’t bother me on this outfit. Not as formal or fancy as I wanted, BUT it fits. And I can wear it again. And it didn’t break the bank. 6) Back to Jabs Gym. A friend of ours hosted a group class at the Eastern Market location and it was so much fun you guys. We wrapped our hands, put on boxing gloves and and did a cardio workout with boxing moves. We each had our own bag which was nice. I’m sure part of the fun was working out with my husband (which we never do. We are solo workout-ers.) and our friends. Whatever the reason, I can’t stop thinking about it and am dying to go back. 7) Our neighborhood pheasant is back, meaning he’s come out of whatever hiding place he uses over the winter. Many mornings over the last two weeks, he has woken me up around 6:30am with his peck-peck-pecking at our front door’s brass kick plate. I did finally get a good shot of him, though, strutting away from the door, after presumably being frightened away by my shadow. 8) Spring weather is grilling weather and I’ve been grilling as much as possible. Everything tastes better on the grill, am I right? 9) I got an email from Zappos last week, telling me how sorry they were for not crediting my account for $148 like over 6 months ago. Which is surprising because I am usually so good at making sure my returns come through. In addition to crediting my account, they gave me $100 to spend – yippee! Best email ever. Have you ever tried this brand of shoe? Sanuk? 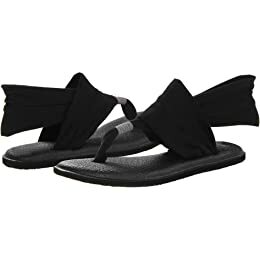 The footbed is made from yogamat material and yes it sounds gimmicky, but the first time I saw them was a year ago on the feet of a gal in the airport bathroom and I asked her about them and she raved about their comfort. So I ordered some to try. 10) I haven’t been over to the Garden nearly as much as I’d like this year, due to work, as I think I say every month. But I will be done with work soon and am looking forward to spending more time there. I did go recently and got to pick tulips and plant carnations. Yes, carnations! I have an aversion to them, but the Detroit Abloom ladies are loving them right now. I’m interested to watch them come up and to see if I will change my mind about them. The tulips we have this year as so beautiful. A variety called Angelique is fluffy and light and doesn’t look like a tulip at all. When open, it reminds me a little of a peony, one of my favorite flowers. 11) I pretty much love chili pepper anything. The cocktail I had at Peterboro had chili oil in it, and my newest discovery – Trader Joe’s Chili Chocolate Collection. These little discs are the perfect late-night snack, because they satisfy both the sweet and the savory. And they are only 50 calories each. They are supposed to range from mild to very spicy, but I have found that sometimes the ones labeled mild are spicier than the ones labeled spicy. So it just depends on the batch, I suppose. 12) Every year birds nest somewhere in the yard. We’ve already had several baby doves hatch. One momma made her nest in our little evergreen out back. The nest was at my eye level, so it was easy to peek in on her. I hope you are enjoying your spring, wherever you are. Have a wonderful May!